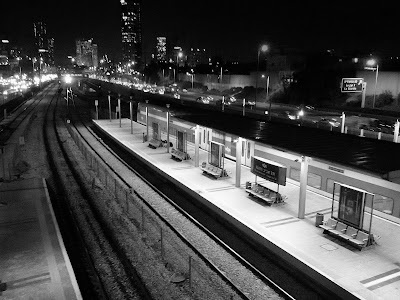 The HaHagana train station in Tel Aviv at night. I recently started to commute to Tel Aviv with the train and has to get off at the last station called the Hahagana station. It means “the defense” in Hebrew and yes, I totally agree that it is a strange name for a train station. Travelling from Benjamina (my home station) one has a quiet and fast 30 minute ride to the first stop at the university. Then the journey carries on to the central train station also known as Savidor, the third one that is called the Shalom train station and with then the last one is HaHagana. If you come to the city to shop or see museums, you will embark at the Shalom station. And the other two will provide further connections inland or take you to the northern suburbs of Tel Aviv. But Hahagana station will be your gateway to the real heart of Tel Aviv. If you disembark there, your destination is down-town baby! The first three stations all seem to have to the more upscale-y disembarkers. The first three stations are also closer to each. It is basically drop the passengers, get the passengers, ride for five minutes and then slow down again to get more passengers. HaHagana station however is a bit further apart from the other three. When I just started my commute into the city I kept feeling that I have missed my stop somehow. The view from the windows show that we are leaving the city behind us and at first I often worried that somehow I left Tel Aviv and am on the way to the airport. Slowly, with every train ride however, I learned to start looking for the signs that I am still on the right track…. As soon as I started feeling that we are leaving the Tel Aviv sky scrapers too far behind, I look out for the graffiti drawn on the flood control channel running parallel to the railway tracks. The sentence “Why did I join the army?” written in huge Hebrew letters, is my first sign. At first I pondered this rhetorical question also and felt sad for the person who wrote it. This is however not the most depressing road sign on my way to the HaHagana station. Not even close. Soon after the rats, the runoff channel is graffitied with a large amount of drawn coffins. Some are large and some are small, some are draped in the Palestinian flag and others in the Israeli flag. Was it maybe the same person who joined the army and became so fed-up and disillusioned that he/she/they took the time and effort to mark the ride into haHagana with this depressing graffiti? The politics here in Israel often causes depression but to go and draw such a large amount of coffins seems a bit extreme to me. I have tried to look out of the windows on the opposite side of the train but the endless rows of four- lane traffic are not much of a comfort either. They just make the graffiti rat race on the other side of the train a reality. Ah, I know now!! It must have been a Russian immigrant! Quite a few of them are Christians, they all go to the army AND all seem to have a creative gene. “Ladies and gentlemen, our next stop is…” and then pause an extra-long pause for extra dramatic effect. It is this pause that makes me question my sanity all over again. WHY is he waiting so long? Are they going to surprise us with a different train station today? Did we somehow travel into a parallel universe and now are going to get the surprise of our lives? Or maybe aliens kidnapped the whole bunch of us..? I quickly backtrack through my steps and assure myself that I am 99% certain that I am on the right train. (The other 1% is left for the parallel universe and the aliens because you never know!) And I did indeed saw the sad graffiti again today. On the way to the bathrooms I slow down a bit and have a quick listen at whoever is playing at the piano in the entrance hall. At the university train station there is also a piano and it only seems to attract serious pianists. One is usually greeted with a classic sonata or a lengthy polks whenever you pass through that entrance hall. At the haHagana train station, the situation is a bit grittier. I have listened to young soldiers playing their own compositions, a gothic teen jazzing up something half-familiar, a cleaner practicing scales and a toddler softly tickling sounds from the patient piano. But then it is time to leave the train station and to start the day. I click myself through the gate and then scurry away with the rest of the crowd like the good little rat that I am. Those coffins have probably been there for a while but I noticed them for the first time on Thursday when I rode the train to Tel Aviv. HaHagana station is named for the street it's on, of course, and the street is named for the Hagana, which was the Israeli "army" before the state was established in 1948. Thank you for clearing that for me, Bari! I'm adding your blog to my blogroll.